Philip and Dr. Dimensionpants are training when they are ambushed by The Cortex./ The blasting of Underwater Creatures and their evil bubbles is Kyle's latest video game obsession, it's awesome! Kyle and Philip run into a pair of grifters who trick them into stealing / Kyle seeks out a special book to win a game show. When Kyle doesn't return the book, he's on the receiving end of a crazy Librarian. Kyle admires super hero Dr. Dimensionsocks but when he learns that this hero isn't all he claims to be, Dr. Dimensionpants must step in to save the day./ The Cortex impersonates Dr. Dimensionpants to give him a bad name. Philip adopts a baby unicorn. The stress strains his friendship with Kyle. To win Philip back, Dr. D reunites the baby with its mother./ Kyle pokes fun at 'Log Man' over the inter-dimensional internet and a battle ensues. Philip is held captive in a carnival forcing Dr. D to literally win back his friend, but is Philip really ready to leave the limelight?/ Kyle forgets his sister's birthday and accidentally steals a gift from an evil wizard. Kyle destroys his dad's new tablet and replaces it with an evil version. Now Dr. Dimensionpants must defeat the robot to save his dad./ Kyle gets rid of a childhood teddy bear who comes back to seek revenge on Kyle. 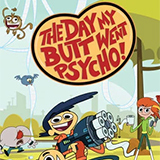 Philip is always telling Kyle how to do things and Kyle is so sick of it that he challenges Philip to NOT help him./ Dr. D destroys the prehistoric dimension and is forced to provide a home for its inhabitant, Caveman Jim. Kyle wakes up feeling 'unstoppable'! It's the perfect day to ask Rebecca, the cutest girl in school, if he can walk her home./ Kyle, in an attempt to win over Rebecca, lies and claims to know the most cool band ever. Dr. D has been avoiding missions he doesn't like. Philip lectures him; with great pants comes great responsibility./ Dr. D and Philip arrive home after a battle in the electricity dimension. They're both looking ruffled.